An unusual thriller with dark undertones throughout, The Roanoke Girls by Amy Engel charts the history of the Roanoke family, seen through the eyes of the female lineage. It begins with Lane and her mum, currently living in New York and not exactly in the best of conditions, with Lane’s mum being mentally unstable. Even though they argue a lot, a teenage Lane is still devastated when she comes home to find that her mum has committed suicide, leaving her with the option of social care or to move in with her grandparents in Osage Flats, Kansas. She takes the option of family, and is introduced to her cousin Allegra and her grandparents, Yates and Lillian, who welcome her with open arms. Lane knows that her mother spent years trying to escape the Roanoke family, but the welcome she receives leaves her clueless as to why anyone would want to leave. Allegra is especially keen to have a friend her own age, introducing Lane to the local hotspots and the local boys, Tommy and Cooper. Tommy is totally and utterly hooked on Allegra, but it is the wayward Cooper who grabs Lane’s eye, with their attraction to each other soon becoming all-consuming. However, Allegra’s reaction to their relationship soon starts setting alarm bells ringing for Lane. She can tell that something is going on at the house, with Yates paying particular attention to the girls’ antics and Allegra being determined for Lane to stay with her in Osage Flats. Fast forward to the present day and Lane receives a call from Yates to say that Allegra is missing, begging Lane to come back and help find her cousin. She hasn’t set foot in the place since she left, but her own sense of guilt at leaving Allegra behind forces Lane to return. She must face the truth about her family once more, knowing that she can’t confide in anyone, not even old flame Cooper. Lane faces a battle to find Allegra before she is lost herself in the dark web of Roanoke. The sinister family undertone of this book is easy to guess from the beginning, but it is the way it almost becomes normalised that creates the suspense in this book. I was intrigued from the word go and loved the shifting perspectives that let us see both past and present Roanoke girls. It is the kind of book that gets more disturbing the more you think about it, yet you keep reading on because you have to know the answers to your questions. As a protagonist, Lane is deeply messed up and has no power to fight against herself, giving in to drink or lust as a means of forgetting her own problems. Her relationship with Cooper became self-destructive for them both, almost a battle to hurt each other the most rather than recognise that what they have could be good. It is Lane’s defence mechanism to block out the world, and even though she loves her cousin, she had to leave for her own self-preservation. It is Allegra that is more of a mystery in this book, as we mainly get Lane’s perspective of her and are not sure of the whys, or what drives her to do what she does. She is a lively spirit with no inhibitions, never being afraid of anything or of doing what she wants. Her and Lane share a sisterhood over the course of that summer, and Allegra wants them to have a bond that can never be broken. She can’t comprehend the thought of leaving, and you are never quite sure whether to feel sorry for her or to get frustrated at her naivety. 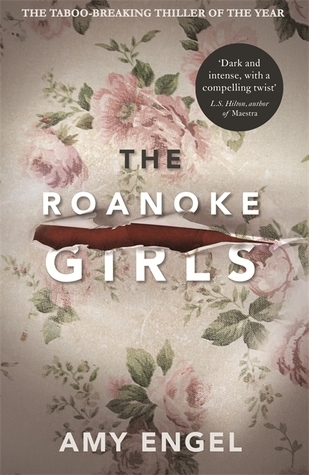 On the whole, I loved that this book was a little different in its level of disturbing, as you know what’s going on but don’t necessarily understand it, becoming sucked in to the world of Roanoke and the plight of the girls. It might not be the best mystery novel, as Allegra’s disappearance is guessable, but it is the suspense and the characters around this which make it such an interesting read and one that I thoroughly enjoyed. A wonderfully disturbing book about one family’s chequered past and the connections of the female lineage. This book was gripping and yet challenging at the same time, somehow getting inside your head until the very last page. I enjoyed the characters and the plot, and although it wasn’t the greatest of mysteries, I thought the suspense was created well and I look forward to reading more by Amy Engel.